Home / Other Sectors/ Cute croc but can mother be far behind? Cute croc but can mother be far behind? A Swiss investor in Sri Lanka, had the shock of his life, while walking his toddlers at Weli Park, Nugegoda recently. 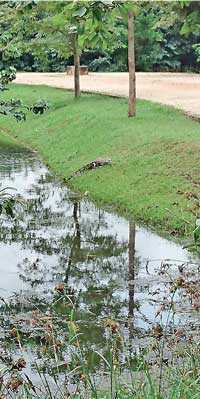 Amid the beautiful scenery at the urban wetland park, he noticed this young crocodile catching the afternoon sun. Andres Wirz, who heads the Sri Lankan operations of Swissphoton, a BOI company that manufactures and exports solar panels immediately cautioned others to be wary.